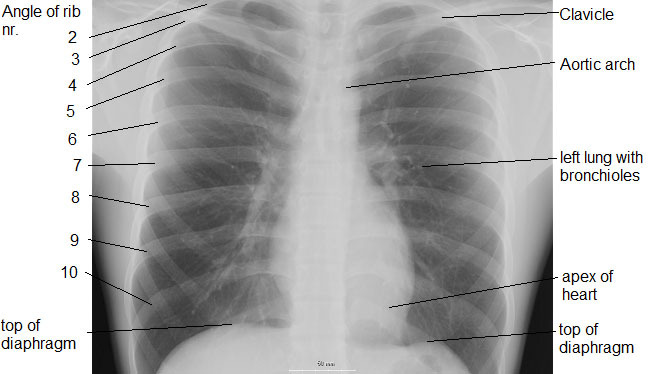 In medicine, a chest radiograph, commonly called a chest X-ray (CXR) or chest film, is a projection radiograph of the chest used to diagnose conditions affecting the chest, its contents, and nearby structures. Chest radiographs are among the most common films taken, being diagnostic of many conditions. Like all methods of radiography, chest radiography employs ionizing radiation in the form of X-rays to generate images of the chest. The mean radiation dose to an adult from a chest radiograph is around 0.02 mSv for a front view (PA or posterior-anterior) and 0.08 mSv for a side view (LL or latero-lateral). Chest radiographs are used to diagnose many conditions involving the chest wall, including its bones, and also structures contained within the thoracic cavity including the lungs, heart, and great vessels. Pneumonia and congestive heart failure are very commonly diagnosed by chest radiograph. 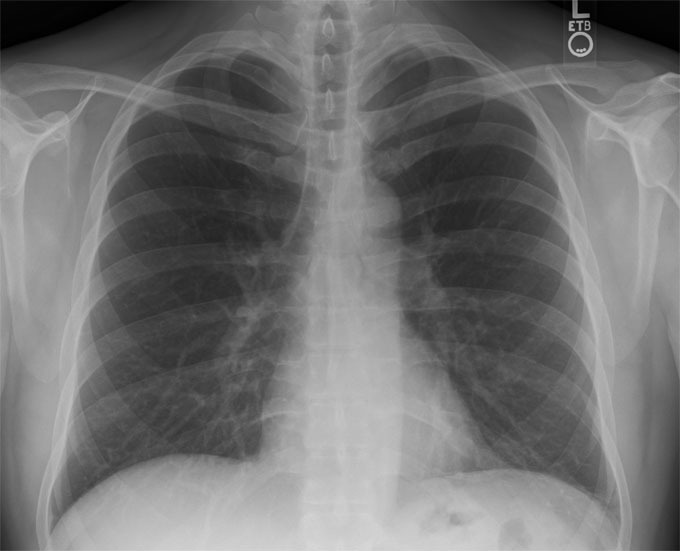 Chest radiographs are used to screen for job-related lung disease in industries such as mining where workers are exposed to dust. Different views (also known as projections) of the chest can be obtained by changing the relative orientation of the body and the direction of the x-ray beam. The most common views are posteroanterior, anteroposterior, and lateral. In an posteroanterior (PA) view, the x-ray source is positioned so that the x-ray beam enters through the posterior (back) aspect of the chest, and exits out of the anterior (front) aspect where the beam is detected. To obtain this view, the patient stands facing a flat surface behind which is an x-ray detector. A radiation source is positioned behind the patient at a standard distance (most often 6 feet), and the x-ray beam is fired toward the patient. In the United States, initial imaging of the chest generally consists of PA and lateral views. In other countries, the PA view suffices as an initial study; the lateral view is only added if indicated from reading of the PA view. Decubitus - useful for differentiating pleural effusions from consolidation (e.g. pneumonia) and loculated effusions from free fluid in the pleural space. In effusions, the fluid layers out (by comparison to an up-right view, when it often accumulates in the costophrenic angles). Lordotic view - used to visualize the apex of the lung, to pick-up abnormalities such as a Pancoast tumour. Expiratory view - helpful for the diagnosis of pneumothorax.